We, humans often claim, we’re the highest form of animals on earth. Although no one can and would challenge this: I disagree that what sets us apart and above, is our ability to love and be loved. Perhaps it’s partly true, but if we buy this, meaning the rest are but predators, which is so wrong. Because, we have pets in our households; we share “home” with them; we co-exist; we even bond. But to further prove my point, below are some great (true) stories of love and friendship among animals. 1. 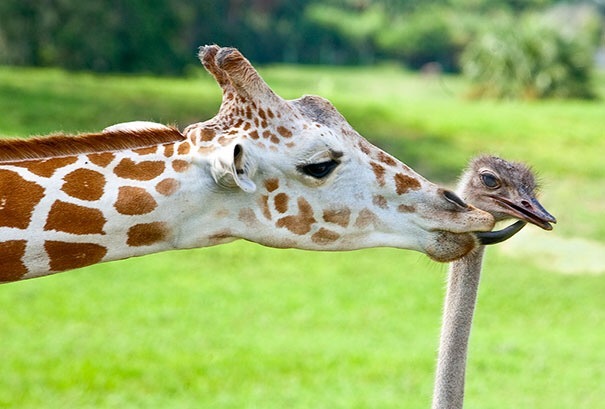 Bea (Giraffe) and Wilma (Ostrich)–No, (with due respect) they aren’t proponents nor members of any special community. They are just BFFs who rather stay close together than wander alone at the 65-acre enclosure at Busch Garden, Tampa, Florida. 2. 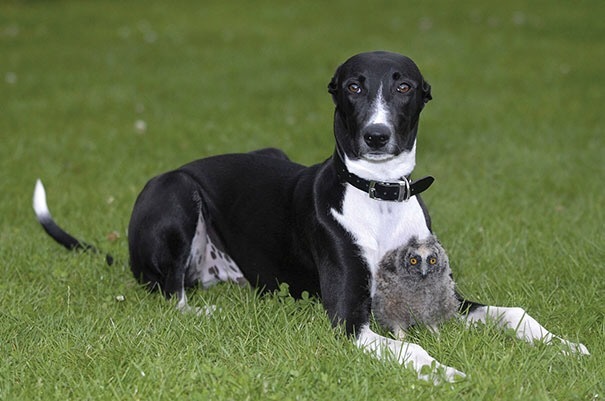 Torque (Dog) and Shrek (Owl)— Torque and his handler adopted Shrek when he was only 6-months old. Apparently, Shrek’s mom was going through some sort of “post-natal depression” that it was feared, she would have Shrek for a meal one day . And so, the handler removed him from the mom and brought to his caring along with Torque. The latter was so welcoming; and, they were best friends since then. 3. 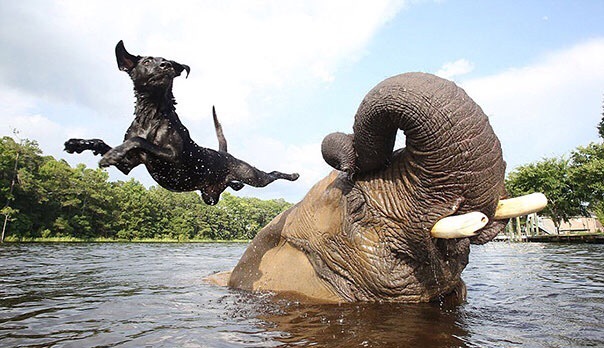 Bubbles (Elephant) and Bella (Labrador)–Who says size matters? Well, not for this two. In fact, silly Bella uses Bubbles as a diving board. The generous elephant is originally from Africa (who is lucky enough to escape ivory hunters) and Bella is but an Am-girl (abandoned in the park by her first handler). 4. 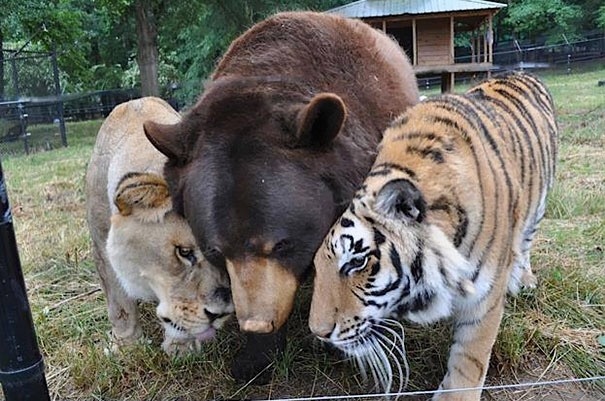 Shere Khan (Tiger), Baloo (Bear), and Leo (Lion)–They were beaten and abused (nearly to death) by their former handler (allegedly a drug addict). Baloo suffered more serious deformities among them three, or as results of cruelty they endured. However, they were inseparable since. They’re now habitants of Noah’s Ark Sanctuary. 5. 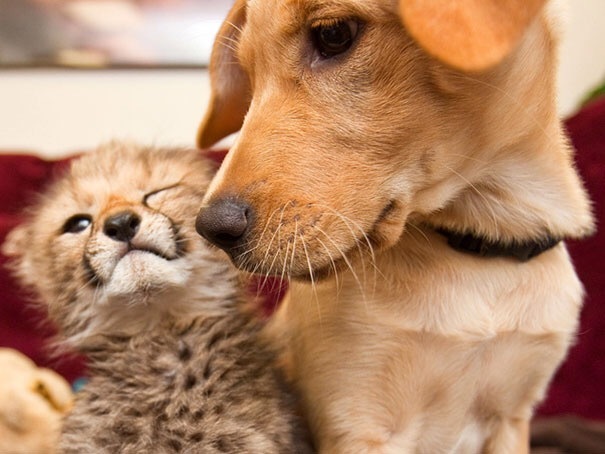 Kasi (Cheetah) and Mitani (Labrador)–These two were my favorites. They were born and raised at Busch Garden. They were childhood sweethearts. However, as Kasi grew into adolescent, he spent more time with female cheetahs. The best part, Mitani was never jealous. 6. 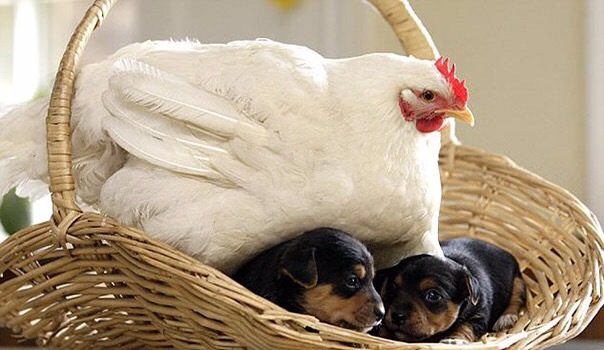 Mabel (Hen) and the Three Puppies (neglected by their mommy)– Three new born pups didn’t lost their mittens; it was just that their mommy didn’t think they need her and the mittens. Thank goodness, Mabel, a very loving hen, roost and kept them warm. 7. 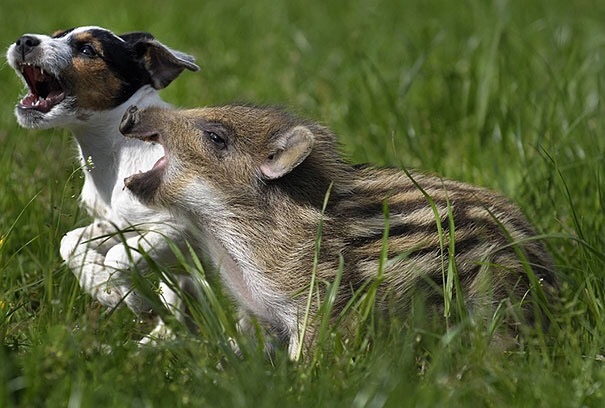 Mani (Wild Boar Piglet) and Candy (Dog)--Mani was found starving in the wilds in Southwest Germany. Their handlers brought him home where Candy was also staying. The two were seen sharing meals and playing most of the time. 8. 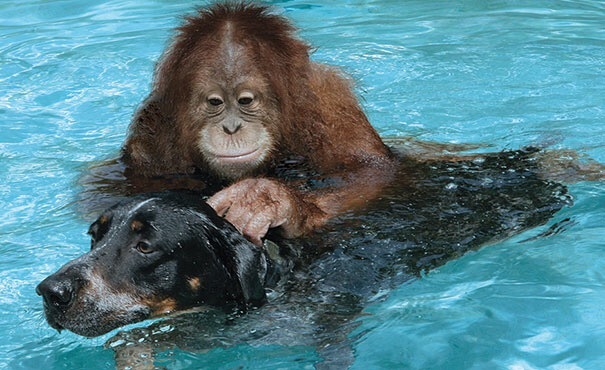 Roscoe (Blue Tick Hound) and Suryia (Orangutan)–It was love at first sight when Roscoe followed Suryia (and her handler) on the very first day she was brought to an enclosure for endangered species. I’m sure there are more other unpublished stories of love and friendship among animals. And I’m also sure there are some who’d be skeptic about these stories. But one of my favorite documentaries about this topic, is March of Penguins. That BBC film features those seabirds at the height of brutal winter in Antarctica. It highlights their courtship and parenting. Both male and female take turn from “finding forever” to hatching of their chicks–what a poignant true story! I suggest you see it to believe. To end, love has many faces. And because it’s so sacred, it is better expressed than spoken. With that being said, we should never patent love exclusive to men. Otherwise, we make animals more vulnerable to cruelty. In Hawaii, we strongly believe in mana. It has no exact English translation; but it is something precious and powerful. It invokes regards; it instills dignity; it upholds respect. The animals and (also) plants are deserving of those as well. Actually, more sacrosanct to us, kama’aina(s) (Hawaii locals), is the theory that both living and non-living things are entitled to mana. For the very reason, someone labored for them; someone brought them to their being; or someone spent sweat and tears–who knows even blood and breath–or life and death–and perhaps love that led to their creation and continued existence. Therefore, we, men, the highest form of animals on earth, empowered by emotional intelligence, we must treat them with at least minimum regard. We owe them outright civility. For when we give such powerful and healing intangibles; we earn them to ourselves. Nonetheless, indeed, when treating animals, we don’t have to think to be compassionate; rather, we must feel them to relate. Note: Feeling feels feeling. All thumbs up, Brad! Thank you! Like you though, sometimes I see “our ability to reason and choose” as a disadvantage; worse, a curse as it “boomerang” back to us (I mean any bad decisions have repercussions). This seems to be the beautiful paradox of humanity and free will. Hopefully, as a species we are learning to use our power of choice more for the good of all, love, harmony, etc. Yes, you’re right: There’s still goodness in this world, Brad. Thank you! What a fantastic post Aina, absolutely wonderful in every way. Cheers to you. Only a big hearted person can appreciate, Francis. Thank you! I remember our conversation about your dog. Hi Aina, me too. I might post some more pics of her in the future, she’s very photogenic. I hope you are keeping well too. Cheers Aina, and thank you for all your support.